2.2 million people have pledged more than half a billion dollars to game-related Kickstarter campaigns. In a post yesterday, Kickstarter's David Gallagher revealed that more than $500 million has been pledged to about 8,000 game-related Kickstarter campaigns from more about 2.2 million backers. 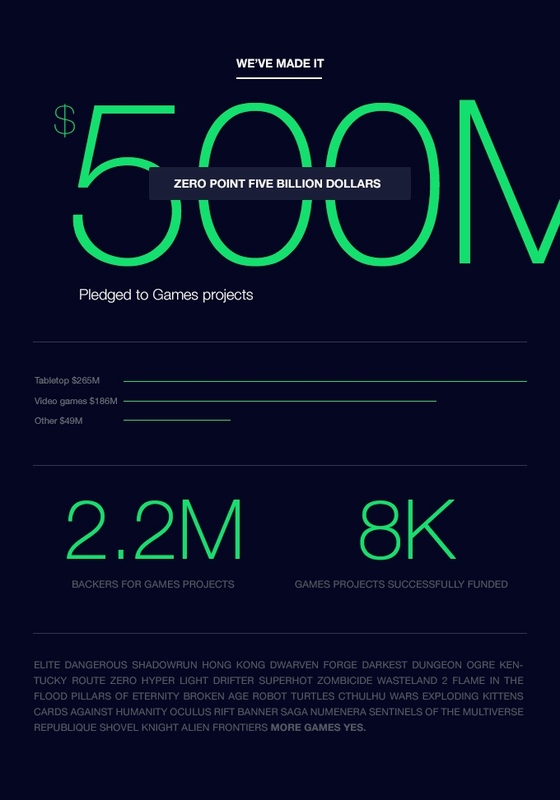 "Sometime last night, one of you went and did it - pushed us over the line, hauled us up to a huge milestone: $500 million pledged to games on Kickstarter," the post reads. "That's half a billion dollars pledged to a wild array of mobile games, party games, artsy games, silly games, FPSes, and MMORPGs." Interestingly tabletop games made up the bulk of that, with $265 million pledged. Video games have seen $186 million, while "other" (hardware maybe?) makes up $49 million. The post also outlines some tidbits from some successful Kickstarter campaigns. For example, of the 758 Cards Against Humanity backers, 440 have contributed to a combined 4,474 additional projects. About half of the 219,389 backers who supported Exploding Kittens were new to Kickstarter, and many have since gone on to back projects like Joking Hazard, Yooka-Laylee, Bloodstained, the Dark Souls board game, Million Dollars, But..., Awful Fantasy, and Chronicles of Elyria. "Overall, more than 2 million people have backed Games projects on Kickstarter, successfully funding nearly 8,000 projects. And more games backers sign up every day," the post concludes. "We're grateful to have a growing community that loves games and loves to show their support for the people who make them. Here's to the next $500 million!" And, of course, there's an accompanying infographic.